In January, we went to Disney World. It was a last minute trip, but even without much time to plan, we were able to figure out what we wanted to do there and even though we were only there for 3 days, we managed to do everything we wanted to do. Here are some of my best tips for a great trip to Disney World! 1. The following sites helped me in my planning. Easywdw.com really helped me with planning out what to do first, etc. Josh lists each month on his site with recommended crowd calendars detailing what parks are best on which days. He also has much advice on what attractions are best to hit at which times. If you are into characters (as we were! ), kennythepirate.com lists where and when you can expect to see which characters. Finally, the disboards are a huge source of information. 2. Speaking of meeting characters, we did a few things to make the experience awesome for the kids. Aside from being first in line for a few greetings, we also brought along props. We carried Gabbie’s princess dress in my backpack until we actually met the princesses. 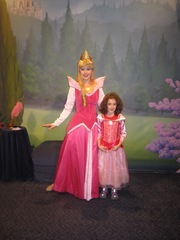 She then put on the dress and posed with Aurora. We also brought along toy versions of our favorite characters. 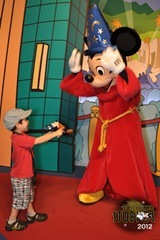 Check out Mickey’s reaction to Zachary’s stuffed Mickey Mouse! 3. I took my own pictures of the kids with the characters, but we also ordered the photopass cd. This way, I could choose photos from the photographers around the parks as well. I would not spend $100 on this though. I was able to find (though facebook) a group of people who would be in Disney World at the same time as us and we shared the photopass cd with them. Depending on the size of the group, you can buy the rights to your photos for $20-$25. If you are planning to do this, make sure to get your photograph taken by all the photographers around the parks. 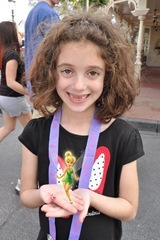 Some of them have magic effects available, such as this picture we had taken of Gabbie holding Tinkerbell! 4. In the photo above you see Gabbie’s pin lanyard necklace. The kids got into pin trading and had a good time with it – as did I! I do have a recommendation that we did not follow though – either buy pins ahead of time off of ebay or from the Disney Store Outlet. You can get pins much cheaper that way and you can plan to trade them – when you buy 10 of the same pin you know you don’t need to hold on to all of them! Also, if you have a pin you don’t want to trade – or lose, because they fall off easily – buy some locking pin backs! 5. Don’t be afraid! We were in Disney in January when the crowds were very low, and I certainly wouldn’t recommend this in April or May, but I actually took all 3 kids to the Magic Kingdom by myself on the second day of our trip! Dave had to work (that was why we were in Florida in the first place!) so I did it on my own. We were able to do a bunch of things we didn’t have time for on the first day, plus repeat our favorites. It was an awesome decision! If you have any Disney questions, feel free to ask me. I have been researching lots of things since our trip, in hopes that we will be back again soon!